Cogdog’s DS106 propaganda post was taken to task by Stephen Downes for “over-branding” ds106. Is the DS106 to much hype? Not real enough? Adrift in a cult of personality? F****THAT #4LIFE. As Martha mentioned in her comment on Cogdog’s post, there’s nothing but love out there in ds106. No hating on someone for not being cool enough, not hanging out and making enough art dammit! Every time you come back it’s, “oh my god, we missed you, so glad to see you again.” Like old friends, no apologies necessary. And isn’t that what so much of the MOOC attitude is supposed to be about anyway? Build your network of learners, your community with people you care about, share interests with? On your own time and terms because when you truly commit and communicate, that’s when the real learning happens? And if the ds106 learning celebration looks a little too raucous for your taste, that’s cool it just might not be for you. P.S. 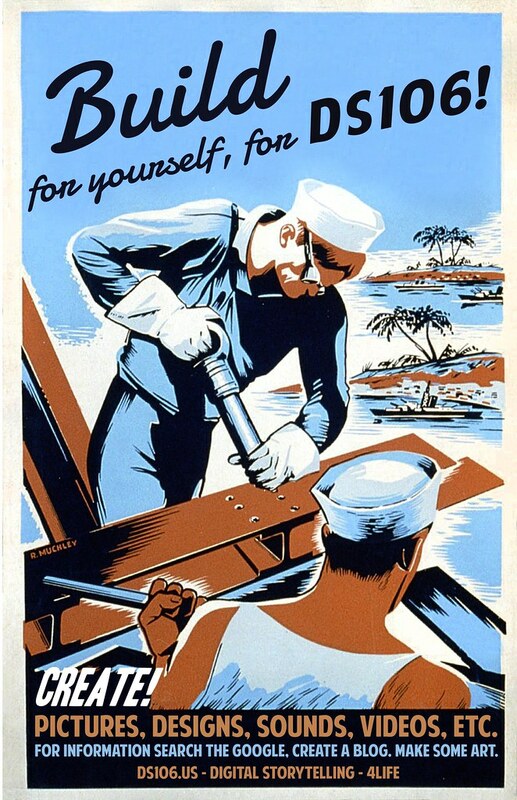 – For the ds106ers out there this poster was based on this original piece of WWII propaganda. I used the clone stamp a bunch to remove the original text. And then worked with some new fonts from dafont and fontspace. What’s funny is that one of them seemed to be built for propaganda – American Purpose & Damion. That’s a really awesome attitude to have. Sometimes, life gets in the way and you miss certain things. It’s great to know that it won’t feel like an exclusive sort of thing in ds106. That’s a really exciting tone to set the course with for me. Kat – It’s why I fell for ds106. Creative types that really, truly wish to learn from one another. Not just a “look at me I’m an artist” crowd. I love this! DS106 isn’t about a brand; I think DS106 stands for something outside of the class. Self education, self improvement, creativity, and community are key aspects that keep the “exclusivity” out of it all. I find myself telling the people I know around campus and outside of academia that they should participate in the discussion and creating. You hit the nail on the head with this one sir. Cheers. The propaganda feel is totally coherent. Just like any good piece of propaganda, I immediately feel guilty that I am not already doing what the poster says. It shames me for not having more nationalistic pride in ds106.